“Tiger Queens” covers the lives of four influential women in Genghis Khan’s life–his first wife, Borte; one of his daughters, Alaqai; a Persian captive, Fatima; and one of his daughters-in-law, Sorkhokhtani. By doing so, the book covers the life of Genghis Khan as well as what takes place after his death, as his empire is in danger of crumbling. The book is divided into 4 mini-books, each one covering the life of one of the four main characters. I liked this book tremendously. The writing is fluid and easy to read. The characters are well drawn. The author does not shy away from the brutality of the Mongol conquests, although the scenes of brutality and violence are drawn with maximum impact and minimal gratuitous desire. Clearly, for this period in time, the many gaps of historical knowledge have to be filled in with the author’s best guesses, but she does so convincingly and tells a compelling story. The large cast of characters with unfamiliar names can be a bit confusing, but there is a list to help keep the names straight. The author also uses historical names for various places, so it is easy to underestimate the breadth of the Mongol empire if you don’t pay attention to the map. My only other complaint is that the book ended too soon–I would very much like to have learned about Kublai Khan’s story as well! For those interested in this time period of history, I highly recommend this book! This is a completely frivolous review of recent discoveries of various beauty products (all of which can be blamed on various Facebook friends who not only like perfume but makeup and skincare products as well—you know who you are!). That being said, I have made some fabulous discoveries of products that I didn’t even realize existed and now are staples in my life. Next is foundation. I have been a Laura Mercier fan for many years (and Prescriptives before that). Then, I discovered two lovely foundation products: Cover F/X drops and Koh Gen Do aqua foundation. Cover F/X drops can be mixed with your facial moisturizer or primer and then applied. You can determine the amount of coverage you get by how many drops you use. And because you mix the drops with your product of choice, the foundation blends well into your skin. I like it especially for medium or heavier coverage, as it blends so well that it isn’t heavy or cakey, and the drops come in a wide range of shades. Koh Gen Do is a Japanese line of skincare and makeup, and I absolutely love the aqua foundation. It is definitely for those who want sheer or light coverage. It is a liquid foundation, but it blends so seamlessly and so lightly that it doesn’t seem like you have any foundation at all. And it’s extremely gentle on the skin. I use it as an every day foundation and really love it. The only downside is that the selection of shades is limited. However, because the foundation blends so well and is so sheer, the color doesn’t have to be a perfect match to still work beautifully. Supergoop is my latest sunscreen discovery. I have been careless about sunscreen through the years and am saved only because I tan and don’t burn. But this is less true as I get older so I have to be a little more careful. Two products from the line that I especially like: the first is Forever Young Handcream SPF 40. I never remember to apply sunscreen to my hands, and this is a nice reminder to do so and keep your hands moisturized at the same time. The lotion has a light, subtle scent that is barely noticeable, and the lotion itself is light and non-greasy. I apply it in the morning before I go to work and then in the afternoon before my drive home. It comes in a 10 oz bottle or in 1 oz travel sizes. I particularly like the travel sizes as I can just throw one in my workout bag or office drawer. The other product that I like is the Refresh Setting Mist SPF 50. It’s a spray that sets your makeup and reapplies sunscreen. Again, it comes in full sized and travel-sized bottles to take on trips or leave at the office. It has a nice invigorating rosemary scent that is almost as effective as coffee (but not quite). My only quibble is that I am clearly a dunce when spraying because if I’m not careful, I get it in my eyes, and that can cause quite the sting. But outside of my incompetence, it does set my makeup well, and I do like to be able to re-apply sunscreen mid-day. The final brand I wanted to comment on is Colourpop, and I want to comment primarily on their lipsticks. The lipsticks are matte coverage lipsticks. I generally prefer something sheerer (my current favorite is the Giorgio Armani sheer line of lipsticks), but at $5/lipstick, it’s a perfect line to experiment with various colors. Because even if you don’t like the shade, it only costs $5. Did I mention that each lipstick is only $5? They carry other types of makeup, too, but I haven’t tried them. (Some of them get as expensive as $7.) I’m just fascinated with the concept of $5 lipsticks. 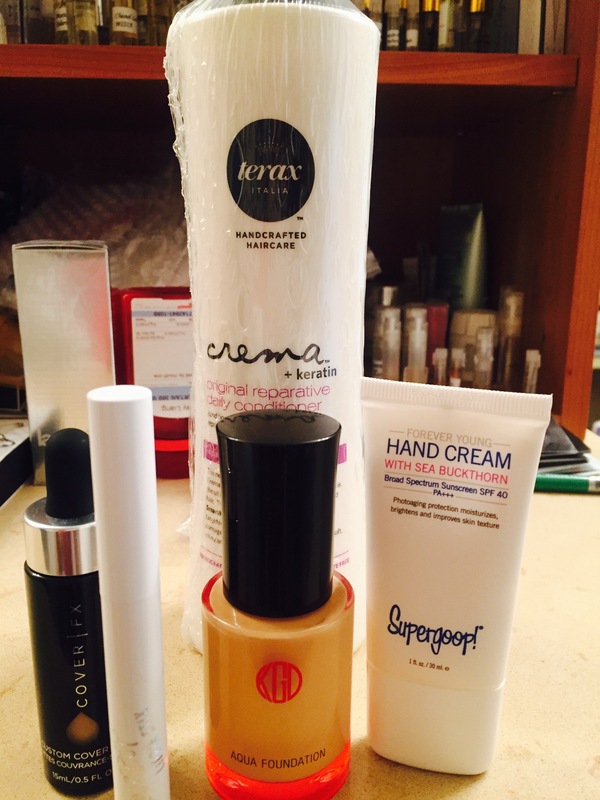 And that is the end of my frivolous beauty products review! Back to food! I confess I have a tremendous weakness for movies with lots of explosions and clever banter where the plot is optional (it helps to have eye candy as well). The latest Avengers movie meets the criteria perfectly in all ways. I saw this movie with the gaggle on Mother’s Day (a perfect Mother’s Day gift!) at Udvar-Hazy, the Air and Space Museum near Dulles Airport with the 86 foot by 36 foot screen and its updated 3D projection system and revamped audio system. It’s a great place to see a movie like the Avengers. There is a semblance of a plot, where Tony Stark (aka Ironman) plays the role of a modern day Dr. Frankenstein. But, really, what this movie is about is a bunch of special effects with a plethora of explosions, and superheroes destroying robots. There’s a fair amount of clever banter, and some unexpected discoveries regarding the personal lives of Clint Barton (Hawkeye), Bruce Banner (Hulk), and Natasha Romanov (Black Widow). There are a couple of new characters, as well, Quicksilver and Scarlet Witch. I’m a big fan of Jeremy Renner as eye candy, and he certainly had a big enough role to satisfy in that way. Fans of Chris Hemsworth and Robert Downey, Jr. will also be happy. If you’re looking for a thoughtful, contemplative movie, the Age of Ultron is not it. But if you’re looking for an entertaining way to spend a couple of hours with excellent special effects and clever dialogue, this is a good place to start. Be sure to sit through the credits for a teaser ending. And, in case you were wondering, the Avengers (in some form or another) will definitely be back!